How to use the eTracks.info server pages to retrieve data from the remote beacons and how to use the queries at best. 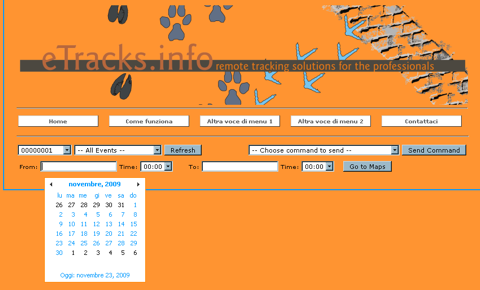 The eTracks.info system is based on four components: the beacon, the communication manager, the database and the command&query routines. the beacon (transponder) is the unit that sends the position data to the communication manager. The beacon can be the LAIPAC units, or any smartphone running the eTracks.info software (soon available for Symbian and iPhones). Our communication protocol is available for third parties ready to develop their software for mobile devices. The user can configure these devices according to their use. the communication manager is a piece of software running on a PC somewhere out there. This software manages the communication between the remote beacons and the database. This software is completely transparent to the final user. the database is the place where your data are stored. Position and additional data are stored on a high-capacity server somewhere out there (due to security reasons we do not tell you exactly where they are). The web pages are also stored on these servers. the command&query routines are the routines that let you have data back according to your needs. These very same routines allow you to send commands to the units from a web interface. Special custom features are going to be added on future releases. How to retreive data from the database. The current web interface. 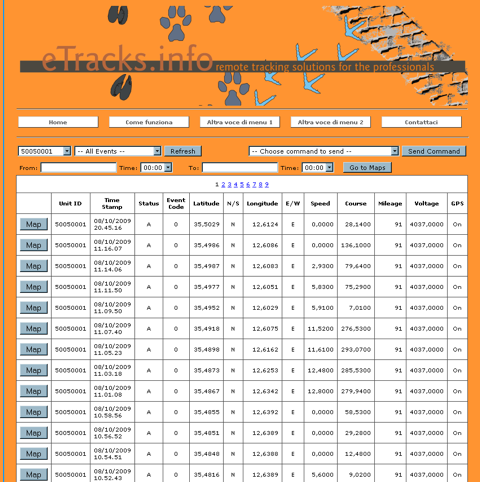 At www.etracks.info you get the above interface. You are requested to login with your username and password. This is the administrative page, you should not get here!? CHOOSE: this is a drop-down selection window. It is used to select the beacon you are interested in. Go ahead and choose one of your beacons. --- ALL EVENTS ---: this is a drop-down selection window. It is used to select the event you are interested in. When you select an event category your report will include only the events that belong to the category you have selected. <-- All Events --> will create a report with all the events received. If you now press you will get a simple list of the events received from that specific beacon. This list will include all the events that match your query criteria. Every entry has a < Map > button that will allow you to get a map of the location of that specific event. This is a drop-down selection window. You can send any of the listed command to the beacon you are selecting. On the next line you can select the period of your query. A drop-down standard calendar, in your language, will help you in selecting the correct period. As for GPS is standard UTC, please consider that and correct the time of your query accordingly. We are going to fix this in a second version. You are now asked to install the GoogleEarth plug-in for your browser, if you have not already done. This is a free software that allows you to see maps within the browser window. Once you have installed the plug-in the browser will appear like the window above: a big map at the center (you can zoom and move just like standard GoogleEarth) and a small link at the top of the map. 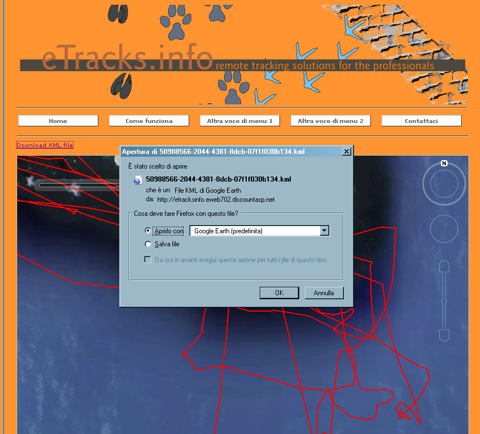 The small link allows you to save the track locally on your computer (and re-open with another software, or store as you like). 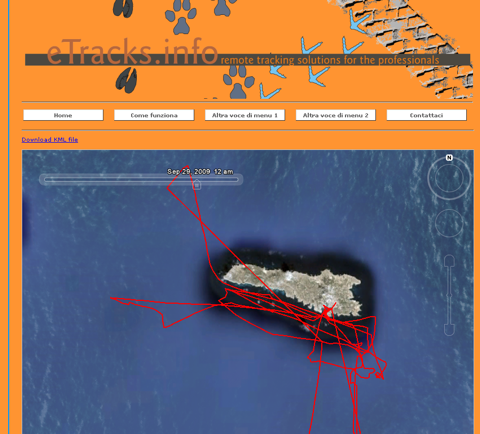 You can zoom-in int your track as you like. A simple timeline in the map windows allows you to show the track points you are interested in, selecting a period of interest. If you decide to save the file locally a "Save as..." window will appear.